Margaret’s inner monologue was, “Are you saying I need to lose weight?” Just what she needed. To be told she needed to worry about her weight when she’d just lost her mother to cancer. She said. “Thank you,” And left never to return. And her ring? Shoved into the bottom of her jewelry box with regret and a bit of self recrimination that she wasn’t ever going to be cute and tiny like her sweet mom who had passed. Many people will say enamel rings cannot be sized. 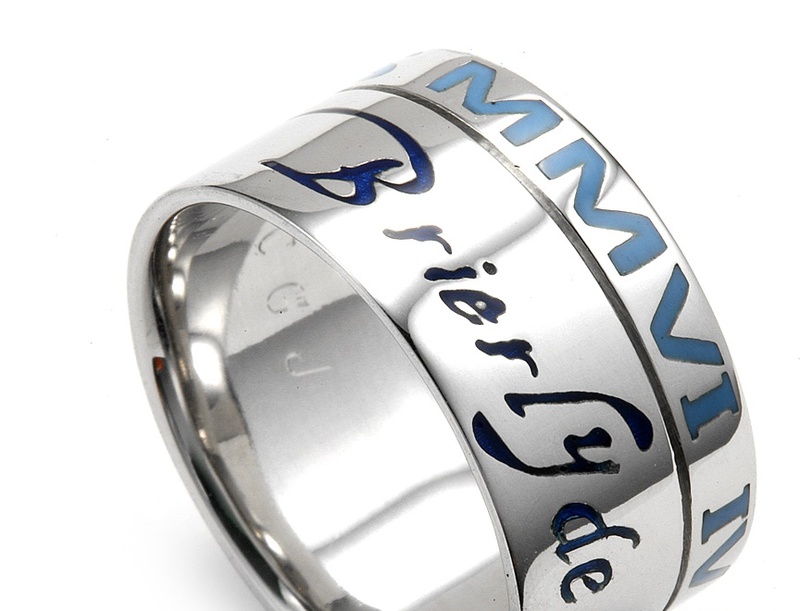 Translation, your ring can be sized, but the enamel will not survive. The heat from the sizing over an open flame causes the enamel to peel away from the gold. But George didn’t tell Margaret that. He just said it can’t be done. That is just wrong. What he should have done was to explain to her what would happen, and that it was a challenging process, but not impossible. And perhaps he should have said, “I don’t size enamel rings, but Susan Fair Jewelers up in Barkton does.” Or something that would have been helpful and kind, rather than rude and dismissive. But if the Enamel Comes off, Isn’t That the End? So what if the enamel peels off? Hasn’t George ever re-applied enamel? Evidently not. 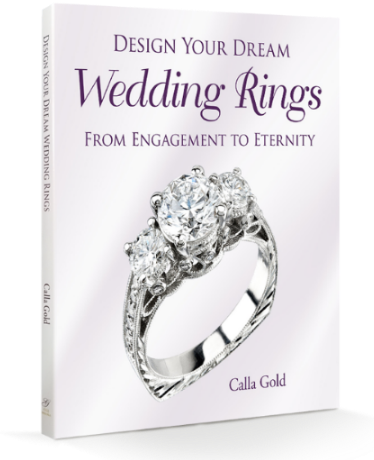 This post was written to share the fact that not all jewelers can size an enamel ring and give it back to you re-enameled. There are jewelers who can size your ring and re-apply the enamel in color that is at least a similar color tone to what you have. For more about enameling check out the Ganoskin blog enameling. If you are interested in the process and the cost, I’m happy to share both with you in this post. 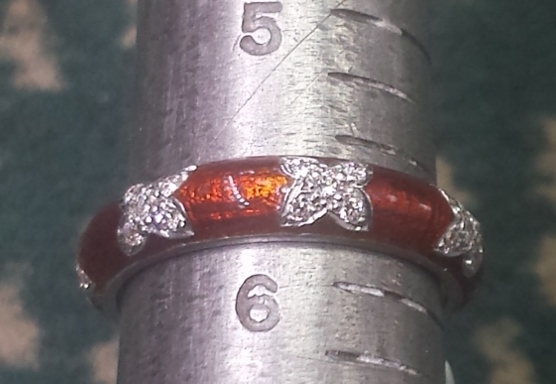 The average cost to go up one size on a 14kt yellow gold enameled ring ranges between $180.00 to $265.00. If you have an enamel ring that you’re not wearing, perhaps it’s time to pull it out of limbo and get it fixed up and back into circulation. 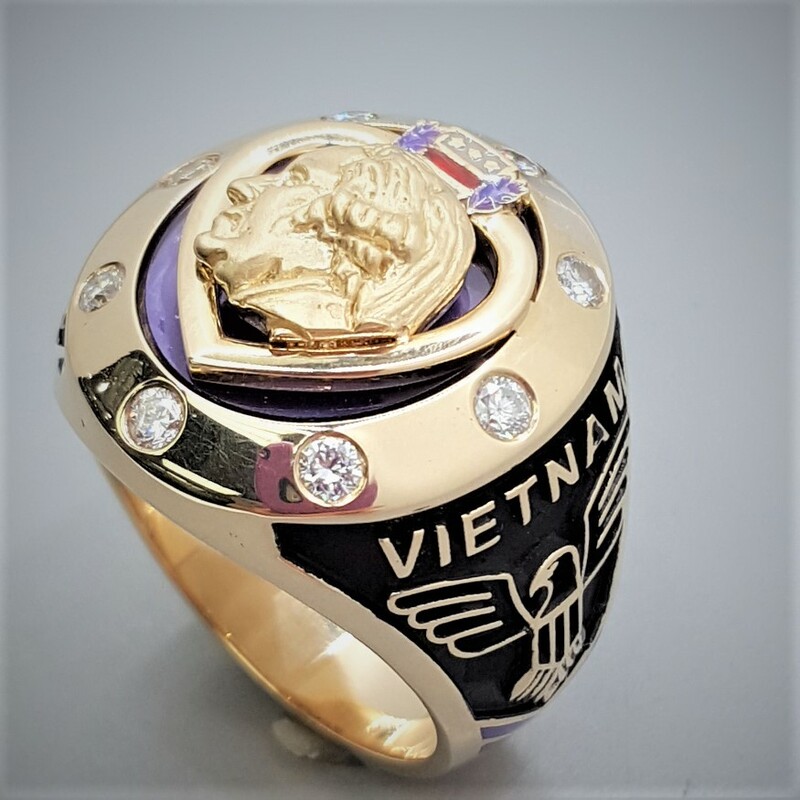 Once the sizing was done this ring, it needed to be re-enameled. We sized it purposely so one of the gold spacing areas was a bit larger. It looked nice. My client had gone over ten years not wearing her enamel rings because she was under the impression that once they were made they couldn’t be re-sized. We actually sized two rings here. 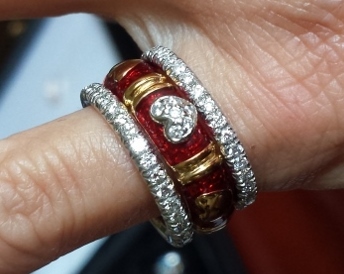 My client had been given two stacking rings. These were made in emerald green to honor her son’s month of birth, which was in May, (Emerald), fifteen years ago. By the time he was a teenager they no longer fit. The jeweler she asked to size them sold her an emerald ring instead. She loved the emerald ring, but missed her green enamel stackers. Interestinly enough, when she tried stacking the green enamel eternity bands with her emerald ring, the three looked great together. I didn’t take a picture of the set. But when I next see her I’ll try to get a snap of them together for you. This ring makes a fantastic stacking ring worn with others. It started its life with black enamel. 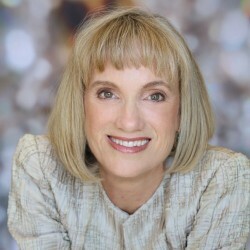 Frances’s mom, who’d always worn her ring with two all onyx thin bands gave it to her. Evidently they broke regularly and her mom had about thirty of them. Frances loved the look of soft Autumn-y colors, whereas her mother’s taste was starkly dramatic and very black and white. I told her that I could size her gifted ring, but the enamel would be damaged in the process and would need to be redone. She asked if she could have a different color and that’s how she ended up with the pretty fall leaves color. Gina fell in love with this ring and wanted it so bad. One teensy problem, it didn’t fit. It didn’t even come close. She contacted me and sent pictures to ask if she sent it to me if I could size it. Ooh a challenge, an extreme sizing AND enamel! When I received Gina’s ring I found that the center part was detachable and kinda rattled when you moved it. 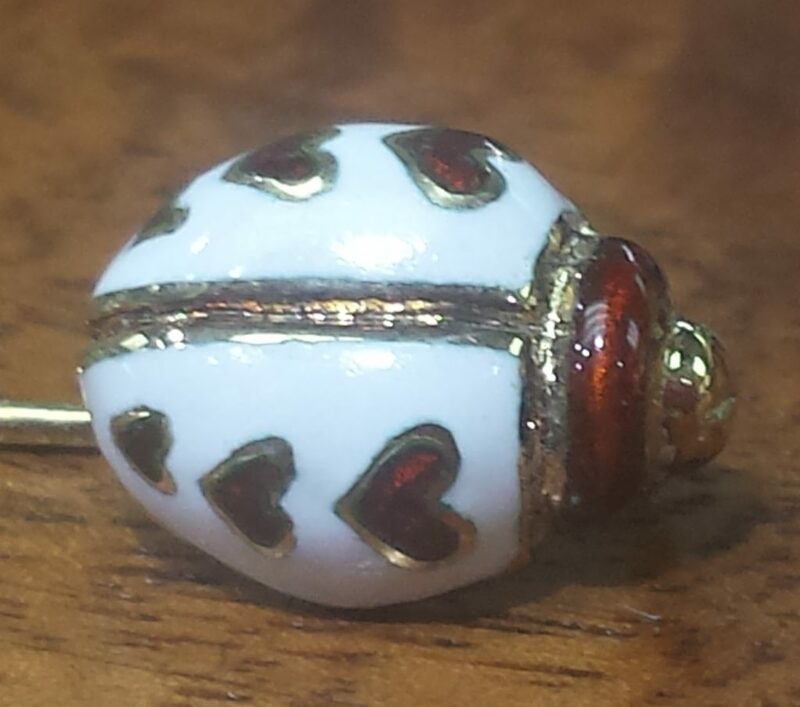 I’d need to stabilize it, after removing it, completing the sizing and adding the new enamel. Her ring was wide and thick and needed a good amount of gold in the bridge I created between the edges of the opened ring. 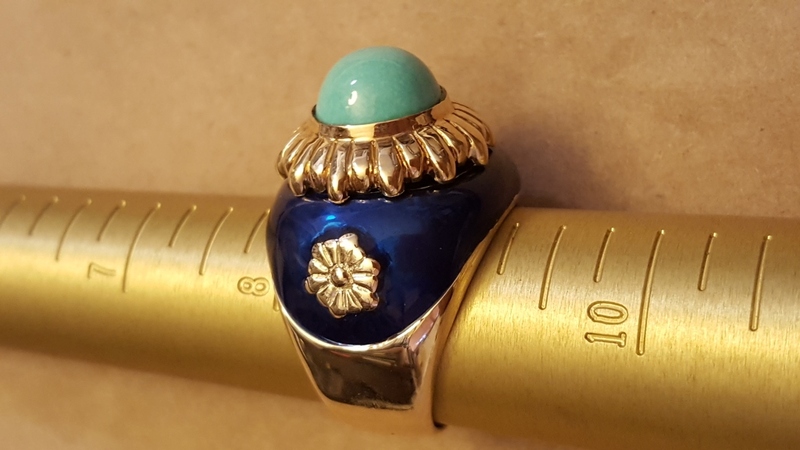 Once I completed the process of the up-sizing and added the fresh enameling, it looked fantastic and Gina is now wearing it and looking great in her new ring. There are designers who do super intricate enameling that is their special technique. 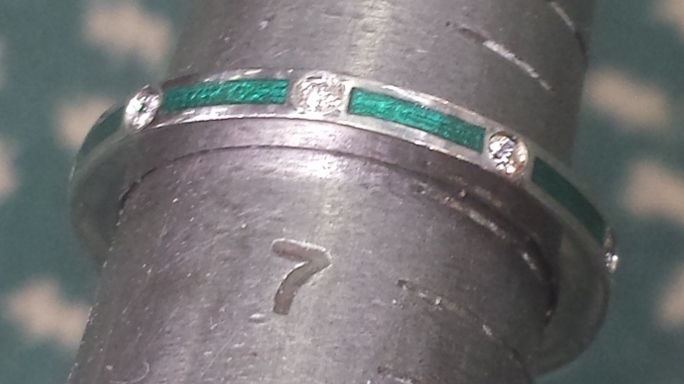 The examples in this post and costs do not apply to this type of specialized enamel ring repair. However, the company that makes it can change it, size it or repair it. An example of this type of intricate pattern enameling is the Wellendorf Company. 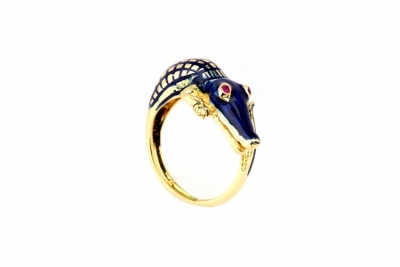 What About the Enamel Ring Sized for Margaret? Margaret met me through a friend of hers in Newcomer’s Club about six months after she moved to town. I’d done some restoration work on her friend’s inherited jewelry and she told Margaret I could do anything. Margaret said, “does she fix enamel rings?” Her friend who I had not done enamel ring said, “sure.” I loved that. I measured her and sized her ring up two sizes and then had my enamel specialist re-enamel her ring purple. Your Enamel Ring Sized up or Down is a Happy Thing! 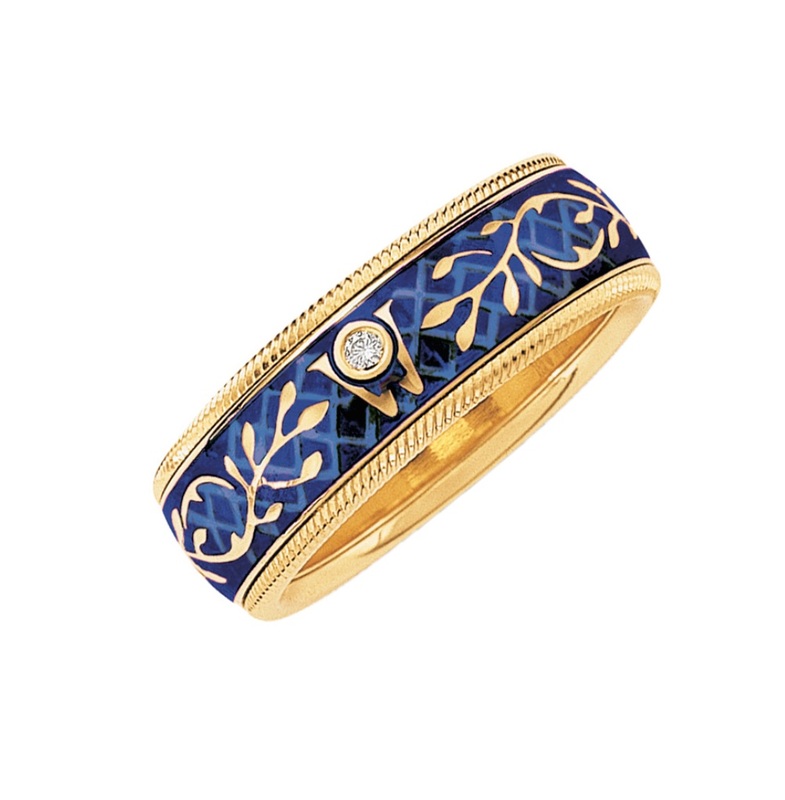 If you have decided to have an enamel ring resized and re-enameled, I’d love for you to share it with me here. Make my day and comment to let me know! I bet far too many people have been turned away from guys like George. Really great, Calla! Calla, I’m a big fan of your sizing blogs. Unlike George, you tell it like it is and I appreciate that! I think it’s so sad when something of great sentimental value like an enamel ring has to be put away for good because of misinformation. 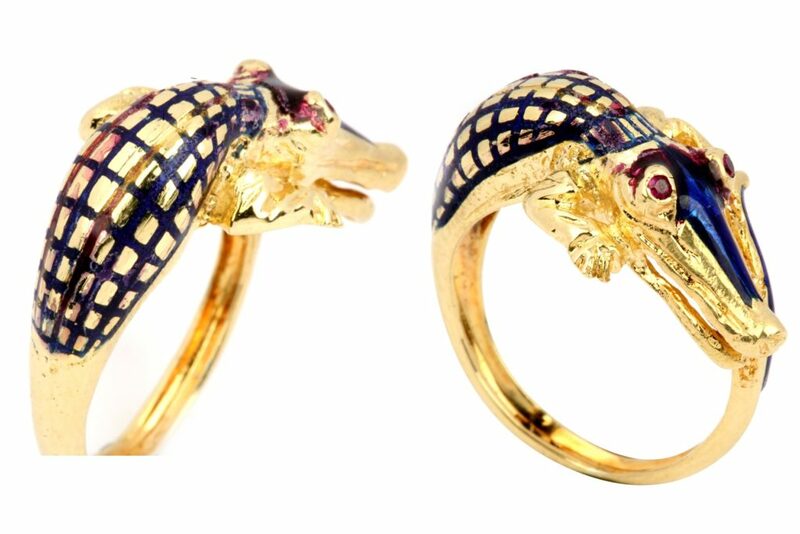 I’ve seen some beautiful enamel rings in my time. Spread the good news that enamel can be repaired and enamel rings sized! I’ve been to a couple of George type jewelers in my life. It’s nice to hear your message about trying again to get something done. Sometimes I assume something can’t be fixed at all because it is old or complicated. But I’m not going to make that assumption anymore. I have an inherited ring I’m specifically thinking of. I may give you a call. The sizing of enamel rings is a good story, Calla. Why do people, and certainly it isn’t just jewelers, say “it can’t be done” rather than “I don’t know how to do it”? For me, that’s the real lesson of the blog post. I liked the enamel lesson, too. As always, thanks for an interesting post. I just sent you an email after reading this topic. My story is identical to others — “it can’t be done”. I look forward to your response and wish you all the best.